﻿ Is it possible to change the width of each drop down css menu generator button separately? Is it possible to change the width of each drop down css menu generator button separately? Q: Questions regarding horizontal menu design. How would one tweak/modify the published code to make all the buttons on the menu bar not to have the same size/width? Is it possible to insert several menus on the same page? How to do that? Hello Is it possible to alter the length of the menu? Where would I find that in the code? 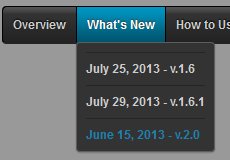 September 25, 2012 Is it possible to change css menu style color in the program?